The client, who commissioned the rocking chair, had already purchased a small stool from me made in yellow pine (Pinus strobus). Liking my work gave me a free range in designing this chair. I already knew the style and type of interior decoration in their home; their furniture taste; appreciation of wood, its colour, grain pattern and texture - all gave a good indication as to what timber to select. I chose burr elm (Ulmus sp.) for the seat, not only for its visual impact but also - more importantly - its interlocking grain pattern, giving strength and durability to the solid seat. I used wych elm (Ulmus hollandica) for its lighter/mellower colour and for its visual grain pattern. I also selected American black walnut (Juglans nigra) for the back splats and for the features to give a contrast and deep colour. But I used it sparingly, due to the cost! 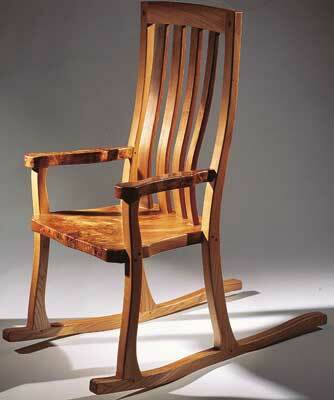 The design and style evolved from actual research into rocking chairs. I had planned to join the seat direct to the legs, thus avoiding the need for rails. There's ample space in the dwelling for the design of long rockers. The chair evolved in my sketchpad and after a few different designs I chose the present one. I scaled 2D projections on the drawing board, and when I was happy with the proportions I drew a perspective sketch in colour and took my design to the client, along with some samples of the timber. After a brief discussion I was given the go-ahead to make the rocking chair. As the rocking chair has a distinct lack of straight lines and few right-angled joints, I needed to plan the construction stage carefully. As makers, we don't always make life easy for ourselves! I found a piece of 9/16in (15mm) plywood to draw out the seat profile which could be used as a template later. I cut the profile on the bandsaw and cleaned the edges with a spokeshave and glass paper, then treated the armrest in the same way. Next, I drew a side elevation full size on a large piece of MDF, carefully profiling the curves and taking care on the joint sites. From this elevation I could trace the various components onto more MDF to give templates for profiling. When doing this (it is the same for laminating jigs) transfer all adjacent joint shoulders and junction points. As the rocker and back splats are laminated, I had to construct two laminating jigs. These are constructed from MDF, profiling each layer from the elevation drawing. Using a router in a table each layer is then profiled using a follower bit to ensure each layer matched the next. The layers are glued and screwed together and one side attached to a strong base plate. The insides are treated with wax to stop glue build-up when in use. 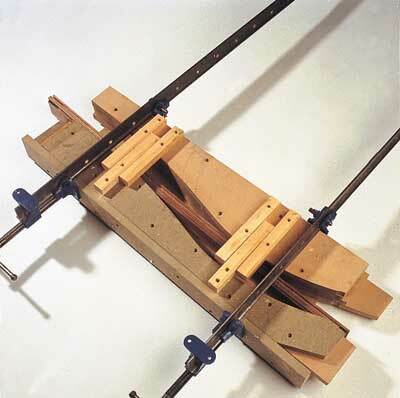 Transfer the shoulder marks onto the jig and used cleats to align the jigs when clamping up. As all the components have templates I placed the templates onto the timber to give the least waste, and drew around them. I also aligned the grain direction with the components, reducing short grain and to give a matching pair. All the components were surfaced and thicknessed first and then cut with a bandsaw to a rough shape. The final shaping to finished size was achieved by using the templates and a template follower router bit inverted in a table. A scraper and sandpaper finished the edges. I start construction with the seat, first joining the two sides together with a substantial ply tongue and glue. The ply template is then pinned to the elm seat, the profile cut with the bandsaw and the shaping completed using a profiling fluted router bit - with the router inverted in a table. However, the router bit did not like cutting on the end grain and I had to be extremely careful. Using a sanding drum in a pillar drill, clean the sides, taking care not to round over the jointing areas. 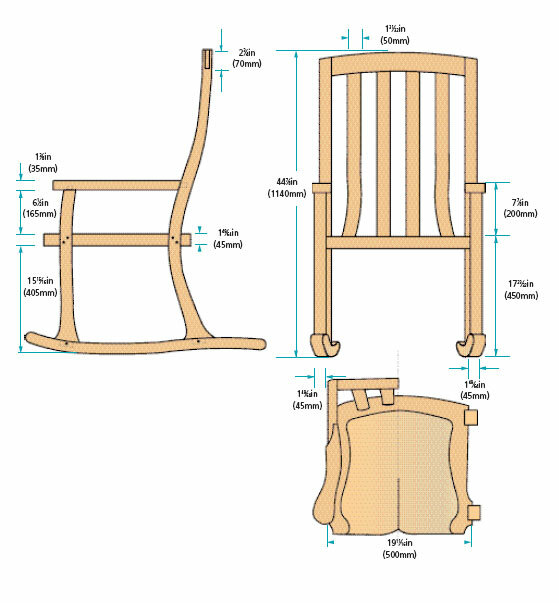 As the seat/leg joint relies on a tight-fitting halving joint, sand to a finish the seat top and bottom to give an exact finished thickness. Using the templates and the follower router cutter give the legs, armrests and top rail their final shape. Next, start the front legs, marking the halving joint from the rod. The shoulders are marked tight with a marking knife. 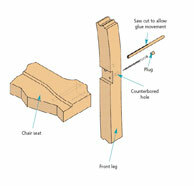 The joint is cut with a tenon saw, the rest is removed with a sharp chisel. At this stage cut the tenon joint for the armrest. The rear legs are treated in much the same way, transferring all joint lines from the rod. The mortice for the armrest is achieved by orientating the leg in the morticer machine vice to ensure the correct alignment. 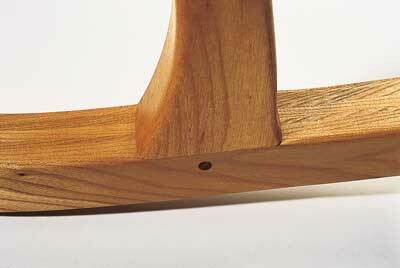 The top rail and rear leg joint is a dovetail. Cut the leg first then match the rail with the leg. If this joint springs slightly, a G-cramp will hold the joint together when gluing. I marked out the mortices for the back splats, allowing for a small shoulder, and took them to the morticer for machining. 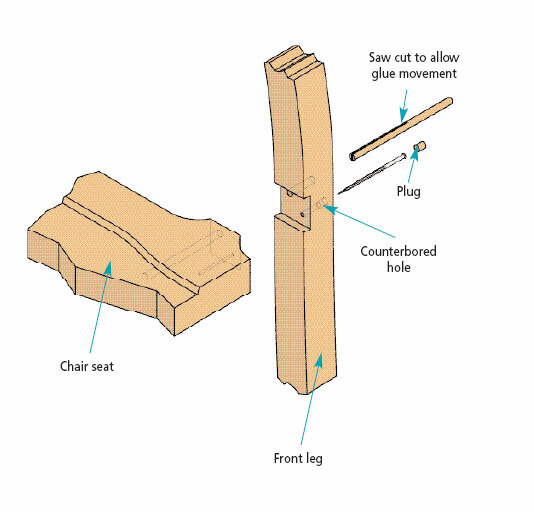 The armrests are relatively simple: cut the mortice with a router and clean up with a chisel; the tenon into the leg is cut with a tenon saw. The chair is now taking shape and can be fitted together on a trial run. I found assembly a bit tricky as you need about four hands! However, with the aid of an old chair seat I can G-cramp the elm seat to it to give a stable platform to work from. Any small adjustments can now be carried out; in particular the armrest shoulders needed a tweak. Now mark out the centres for the featured American black walnut pegs and caps. Give additional strength to the seat/leg joint by using a turned 6in (150mm) peg and a 4in (100mm) screw with a cap. I drill the legs with an 5/16in (8mm) brad point bit, full depth for the pegs and 3/8in (10mm) deep for the screws. Drill the screw holes further with a 3/16in (5mm) bit. When drilling the holes for the seat/leg joint, drill marginally into the seat, to mark the holes with the corresponding drill bit. 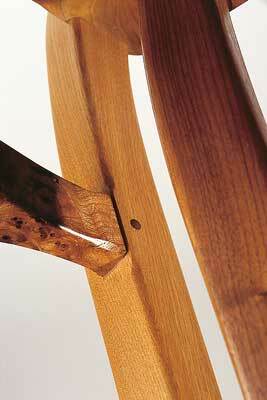 The armrest is pegged from the inside only - therefore the holes are stopped. 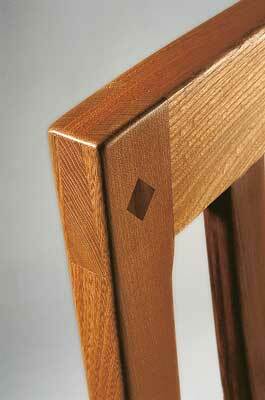 The top rail/leg dovetail is pinned with an 5/16in (8mm) peg, but then capped later with a diamond-shaped feature inlay. Once taken apart again, drill the seat, reaching as far as I can with the peg holes. Drill the screw holes with a 1/8in (3mm) bit. Next, I turn a batch of American black walnut pegs and caps. The small diameter turnings proved quite awkward as the lathe vibrated a little too much for my liking and, combined with my inexperience in turning, I was pleased they all turned out fine. To stop build-up of glue pressure I ran some saw cuts in the ends of the seat/leg pegs. Returning to the seat, mark and cut the mortice slots for the back splats. Orientate the splats on a slight curve to give a moulded support for the chair user and it had the effect of wrapping around the lumbar region. To shape the seat into the classic 'bottom' shape I use an Arbortech cutter on an angle grinder, a drum sander, shaped scraper and sandpaper. I had bought the Arbortech tool for this job and practised on some scrap timber first. As long as I took it gently, it performed excellently and is a fun tool to use. However, do use thick gloves, facemask and eye protection and take it easy! The seat shaping only took a couple of hours and the cost of the Arbortech proved a good investment. The top tenon joints on the back splats are relatively simple. 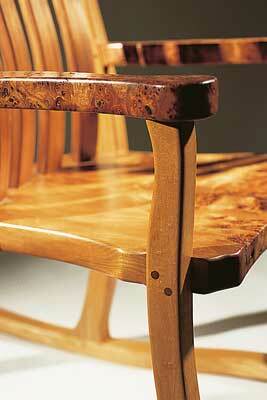 Use barefaced tenons with small shoulders, then cut with a tenon saw and pare with a chisel to produce a crisp joint. I fit these to the corresponding mortice and check for fit. Cutting the bottom tenons, measuring the length with the curved laminations, is problematic. The distance should be set out on the original rod. However, as a precaution make a lath to check the distance. I was still a little apprehensive, so as an extra precaution I cut the shoulders 3/16in (5mm) longer. The fitting is time consuming because to fit the splats I needed to re-assemble the chair every time. Finally, I got the distance right, but still needed to angle the shoulders slightly on the outside splats to accommodate the plan radius. 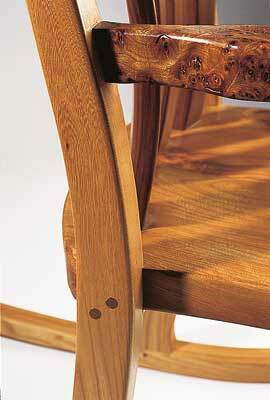 After cleaning the rocker laminations, edging and thicknessing them, mark the rocker curves for the rocker movement. To achieve this, trace the curve from the rod and use the tracing paper on the laminations to obtain the desired shape. The MDF template did not bend so easily. The tracing paper had the advantage of following the 'S' curve on the laminations. Next, mark the mortices for the rocker/leg joint and took them to the morticer, again orientating them to the correct angle. Cut the leg tenons next by hand, leaving the final shoulder shape to last. I did consider using a washer and pencil method to copy the gentle rocker curve onto the leg shoulders, but the dry fit was close enough to see where the shoulders needed adjusting. I do tend to do things by eye and only make jigs as the last resort - presumably because of time pressures! Happy with the rocker leg junctions, drill 5/16in (8mm) holes to receive the American black walnut pegs. All the laminations are then cleaned up, making use of a scraper and sandpaper. All the components, apart from joint areas, are given a pencil round and sand, to 120 grit. I use 400 grit for the seat top before finishing. Glue up the sides of the chair first. 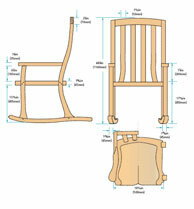 Using an array of sash cramps, evenly applied pressure could be obtained between the rocker and armrest. As a precaution, fit some scrap timber into the seat halving joints, to keep the assembly square and true to the seat plane. Gluing the rest of the chair together needed some speedy work. As mentioned before, G-cramp the seat to an old seat to give a stable platform to work from and utilize this in the final gluing-up process. First, run glue into the seat mortices, place the back splats in position and run some glue into the peg and screw holes. 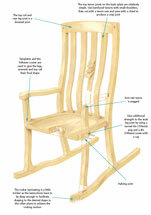 Ease the side assembly onto the seat after gluing, aligning the joint planes and holes up. Next, the top rail is placed in position onto the back splat tenons and at the same time connecting the top dovetails into position. Sash and G-cramp the top rail and dovetails together, not forgetting the peg. Sash-cramp the legs to the seat, taking care to keep the legs square with the seat. Ensuring the shoulders of the back splats are pulled up was not easy, as an uneven pressure tilted the shoulders on the front. Then screw the leg/seat joint and drive the American black walnut pegs through the legs and into the seat - after applying glue to the pegs. Breathing a sigh of relief, I leave the assembly to cure. After curing, remove the cramps, flush off the pegs, sand any pressure marks, remove any excess glue and give the chair one final sand. The penultimate task before finishing is to make the diamond feature inlays, cut the recesses into the tops of the legs and glue in place. Once set, flush off and lightly sand. Three coats of Danish oil are applied, rubbing down with wire wool between coats. Finally, the rocking chair is carefully delivered to the client's house and is met with approval. 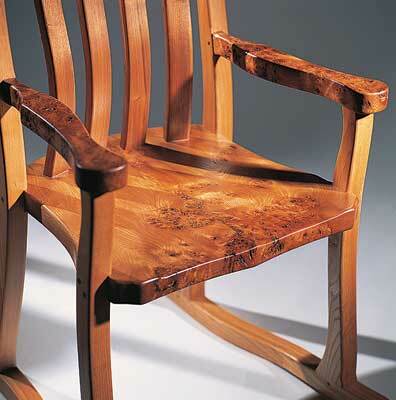 They particularly liked the use of burr elm and the contemporary look of the chair. The rocking chair proved a success. However, next time I'll make the rockers wider, mainly for aesthetic reasons, and shaping the outside of the front legs by the seat junction would give the front a more organic look. Alternatively, the rocker can be given a faster rock, for more youthful clients! Bandsaws have a relatively small footprint and are often the first choice of machine as they can perform a variety of operations. A good quality machine accurately adjusted, with sharp blades can do rip cutting including deep ripping or even thick veneers, it can cut tenons for joints and various awkward shapes including tight curves if a narrow blade is fitted. For solid timber it is usual to fit skip tooth blades, these have a gap between each tooth thus allowing waste to clear quickly. For thin ply or MDF a fine tooth blade is needed. For accurate perpendicular drilling the drill press cannot be bettered. The speeds can usually be changed via a belt change in the top case of the machine. Drill bits including very large diameter cutters such as forstner bits which may not have a 'centre' can be fitted in the chuck, these days there are keyless versions as well as the traditional keyed version. An adjustable drill table which can move up and down is used to place the workpiece under the drill for machining. There is always a depth stop feature so the depth of drilled holes can be set precisely. 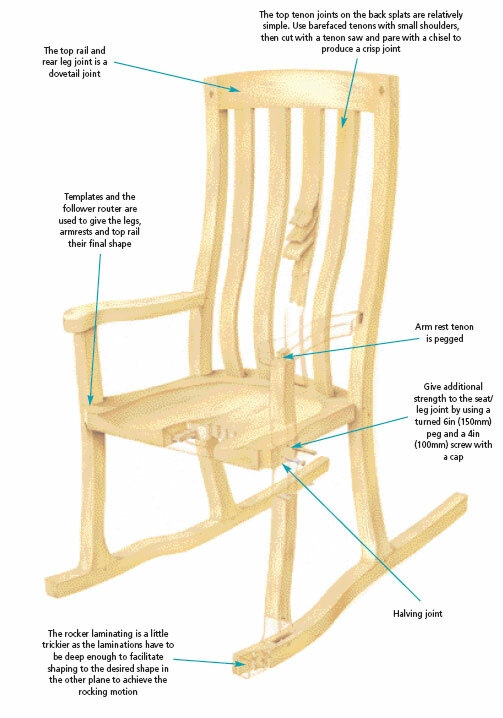 "All the components, apart from joint areas, are given a pencil round and sand"
Alongside the general construction process laminate the rocker and back splat components. The back splats are easier, mainly because they're smaller and are shaped in one dimension. Bandsaw strips of American black walnut 1/8in (3mm) thick, returning the stock to re-surface after each cut. Once there were enough strips, I could thickness them in the machine on a flat board. This extra time spent gives a better visual integrity to the laminations once glued up. As the back splats need to be at least 1in (25mm) thick I use 10 strips at 3/32in (2.5mm) thick. Use Cascamite glue for laminating and apply a liberal coat at a fluid consistency. otherwise the laminations will be a lot thinner than required. The jig assembly is left overnight to cure and the morning is spent repeating the process. The jigs may need cleaning after use but keeping them waxed helps the process. The rocker laminating is a little trickier as the laminations have to be deep enough to facilitate shaping to the desired shape in the other plane to achieve the rocking motion. On plan the chair is wider at the front than the back. The rocker connects the two legs with a gentle 'S' curve, this is the laminating plane. The strips are thicker than the back splats, around 5/32in (4mm) and are 4in (100mm) deep. The laminating process is much the same. However, it's a bit harder as the sections are bigger and the pressure needed to pull the jig up are greater. Once the laminations are cured and taken out of the jigs, I clean the faces with a scraper to remove any excess dried glue, then edge them on the planner and thickness them to size.